We headed north after departing the Amalfi Coast, our ultimate destination being the Italian Riviera, but we broke up the drive with a stay in Tarquinia. I’ve rarely been as happy to leave a place as I was the Amalfi Coast. What a relief to be on level ground again! I’d never heard of Tarquinia, but I was eager for a place off the beaten tourist path but with some interesting history. Tarquinia was a big win on both fronts. It’s the site of an Etruscan Necropolis, with tombs dating back almost 2500 years. 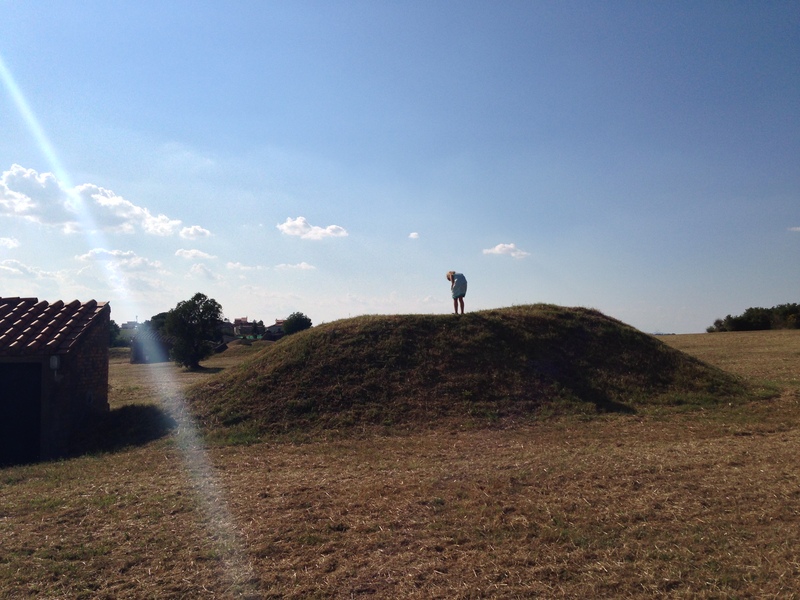 They are located under a large grassy field on a hilltop just outside of town and at first sight are unassuming mounds of the earth. 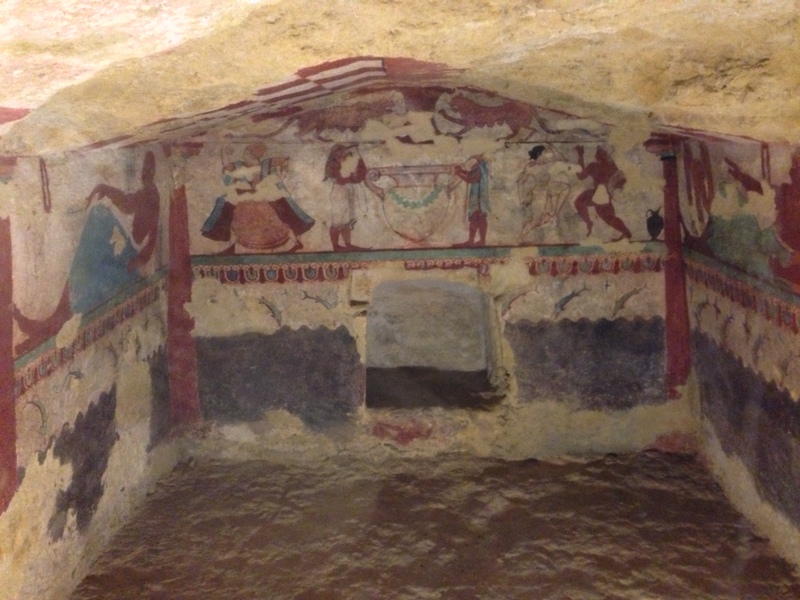 However, each tomb is reached by entering a shelter adjacent to the mound and descending a staircase about 30 feet, where the burial chambers are carved into rock and brightly colored paintings depicting Etruscan life still adorn the chambers. The entire site was very quiet–just a few other visitors–which was such a welcome change after the crowds of the prior weeks. The town itself was also lovely and populated primarily with Italian tourists. A perfect place to while away a few hours in one of the town squares cooling off with some of the local frizzante. It’s the type of town that it is easy to imagine spending a few relaxing weeks (or months) in. On the way home from dinner, we met a Swedish woman and her teenage daughter (out walking their cats on leashes (!)) who have lived a nomadic life for years, but are currently calling Tarquinia “home” (a cave in Spain was another recent abode). 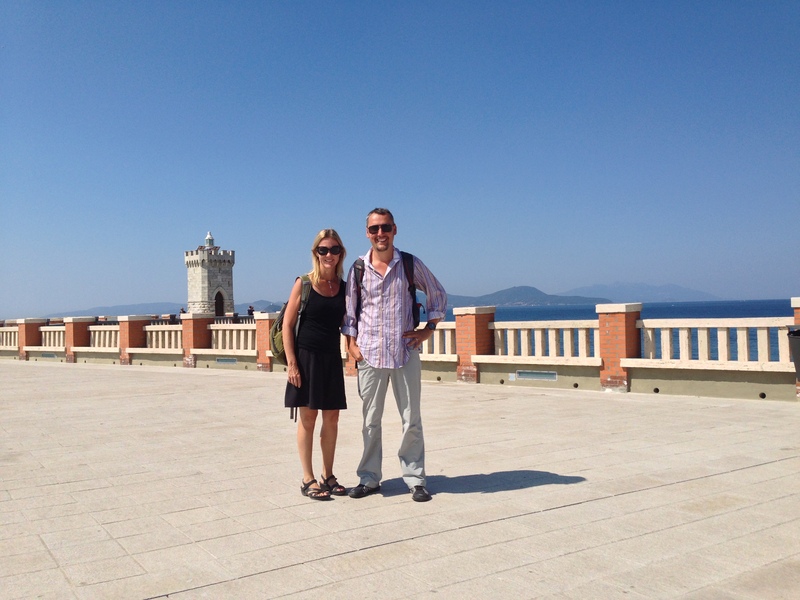 As we headed north the next morning, we stopped for coffee in the seaside town of Piombino, where we could see Elba in the “not far enough” distance. (I hadn’t appreciated how close to shore Elba is and it clearly wasn’t remote enough for Napoleon’s exile.) 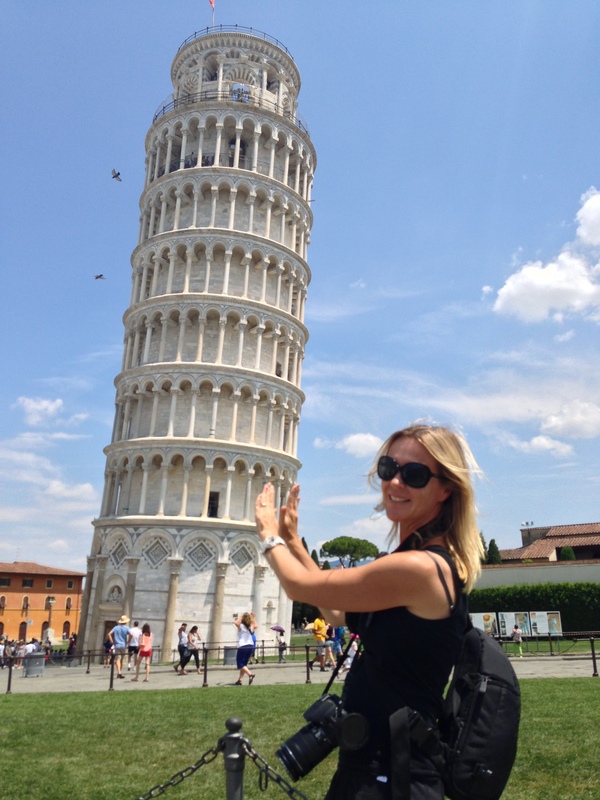 After we fueled up, our next stop was Pisa and its leaning tower. The contrast to the Etruscan Necropolis couldn’t have been greater, with busloads of tourists and day-trippers from Rome. Still, it was surprisingly cool to see in person. 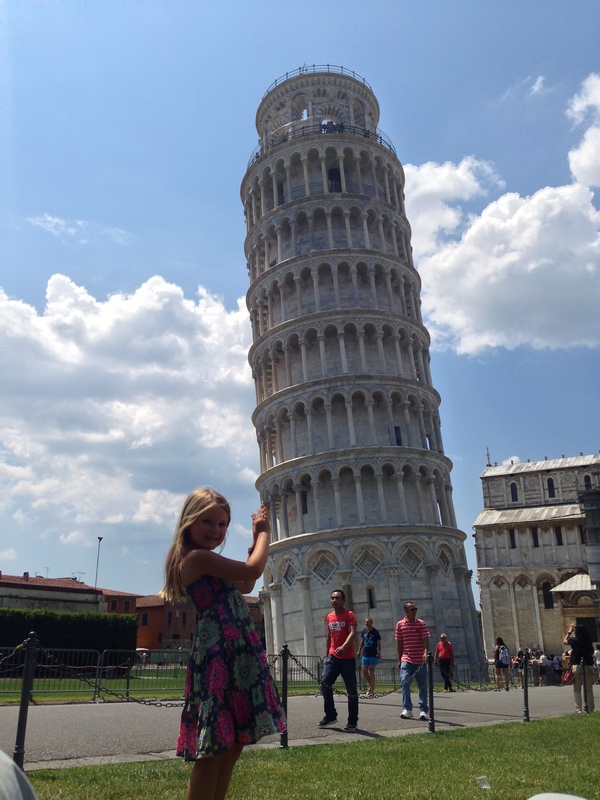 Interestingly, we learned that when Jonathan visited in 1988, it had leaned nearly twice as much as it does now, as they closed it in 1991 for about eight years to stabilize the tower after another one nearby unexpectedly toppled and the stabilization included some necessary straightening but not enough to take away the tourism appeal!